AMSAT-UK member Andrew Garratt M0NRD got some good publicity for Amateur Radio from the recent ISS Slow Scan Television transmissions. The SSTV pictures were sent in celebration of Yuri Gagarin becoming the first human to reach space, on April 12, 1961. 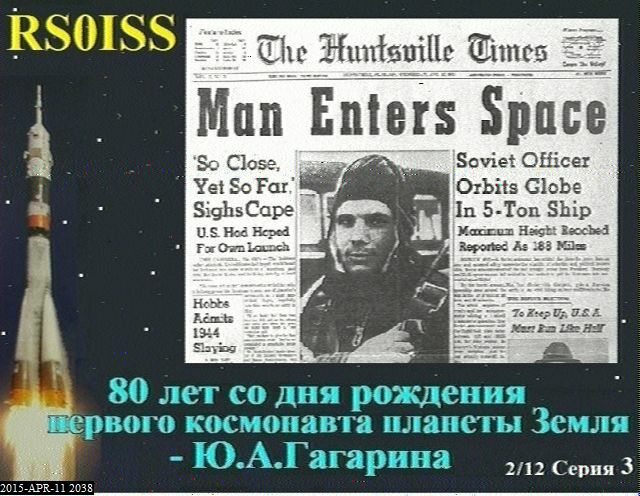 The Russian cosmonauts on board the station transmitted images from Gagarin’s life which were received by radio hams worldwide. Andrew said he hoped it would encourage more people to become interested in radio. Local newspapers are generally only too glad to publish stories like this if someone takes the time to get in touch and tell them about it. Andrew made sure the newspaper was aware of his local clubs website URL and Facebook page enabling those reading the story to contact the club. Note the ISS transmissions on 145.800 MHz FM use the 5 kHz deviation standard rather than the narrow 2.5 kHz used in Europe. If your transceiver has selectable FM filters try the wider filter.